Drywood termites, unlike subterranean termites, are found only in regions that don't experience freezing temperatures. Occasionally, when an infested piece of wooden furniture or wooden article is transported to colder regions, these termites also infest a home in a colder climate. Unlike subterranean termites, drywood termites don't need moisture and spend their whole lives, except for swarming, inside dry wood. You can get rid of drywood termites with a whole-structure or localized approach, depending on the extent of the infestation. However, treatment should be performed by a licensed exterminator. Many treatment options are available, but most companies offer only a few. If you know what your options are, you will be able to choose a company that has the appropriate treatment method for your termite infestation. Search out drywood termite infestations by checking the outside of your house, windowsills, eaves and suspected objects with a flashlight, screwdriver and hammer. Lightly tap suspected wood with the hammer. If it sounds hollow, you may have an infestation. Probe with the screwdriver to detect tunnels. You probably will not see any termites unless they swarm, approximately once a year or even less often. But three tell-tale signs will reveal an infestation. A pile of wings, discarded after swarming, indicates termites. A mound of tiny tan and black pellets is another sign, because termites discard their feces and waste outside their colonies. Another sign is spots and lumpy trails of a muddy substance on the siding of your house, because termites patch any holes in wooden siding by mixing dirt and their own feces. 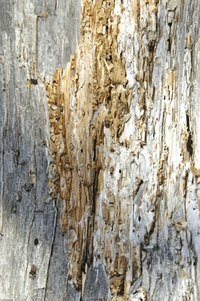 If you discover these tell-tale signs, call a termite company for a complete investigation. Select a treatment based on the nature and extent of your termite infestation. Use cold treatment if your drywood infestation is localized. The exterminator will drill a hole into the wood and inject liquid nitrogen. This treatment kills termites quickly with no adverse effects to the wooden structure, people or pets other than the drilled hole. Use heat treatment if you have a localized or even an extensive termite infestation and you don't want to deal with chemicals. You don't need to drill holes, but some exterminators may want to for closer proximity to the termites. Use microwaves to kill drywood termites. Portable devices are available. It is not necessary to drill holes. The efficacy of eradication is 89 to 90 percent, dependent on detection accuracy and treatment time. Treatment time for 1 to 2 feet of wooden board is 10 to 30 minutes. As with heat treatments, areas that absorb heat (heat sinks) may reduce the method's efficiency. Electrocute termites. You can rent portable electric devices that kill drywood termites by electrocution. You don't need to drill holes to use the device, but eradication is often more effective when holes are drilled. Inject a chemical into a localized termite infestation. After a hole is drilled, the chemical is injected into the infested wood. This is one of the oldest termite eradication methods. It is up to 90 percent efficient and long-lasting, but depends in part on the type of chemical used and detection accuracy. Fumigate the whole house or structure if the infestation is extensive. The exterminating company will surround the house or structure with a gas-tight tarpaulin and then gas is released inside. This procedure requires the removal of all pets, plants and food items. Following fumigation, the house cannot be entered until the air is tested and shown to be safe. The whole procedure usually takes 24 hours or longer. Prevent new infestations. When possible, replace damaged wood with pressure-treated wood. Paint wood. Drywood termites will not enter through painted surfaces. Use a temperature probe when using liquid nitrogen to reach a level that is lethal for drywood termites. When observing swarming winged termites, make sure they are not winged ants. Ants have pinched or segmented bodies, while termites are not segmented. The devices that generate heat or microwaves may damage the surface of wood and other heat-sensitive items such as plastic outlet covers.